Cost to pressure wash a deck varies greatly by region (and even by zip code). Get free estimates from pressure cleaning experts in your city. Cost to pressure wash a deck varies greatly by region (and even by zip code). Get free estimates from pressure cleaning experts in your city. How much does it cost to pressure wash a deck? Pressure washing is one way to revitalize a deck. It strips grime and filth away from wood using cold water and, sometimes, chemicals. Typically, pressure washing is used to prepare a deck for restaining or painting. For the following cost comparisons, we are using the typical American deck that is made of wood or wood composite and is about 300 sq.ft. Labor costs: Bring in a professional pressure washer for cleaning a deck. Pressure washing costs between $60-$100 per hr. An deck of less than 500 sq.ft. will take about 1-2 hours to clean and cost of between $60-$200. Water Costs: The cost of the water in pressure washing is very minimal. A professional pressure washer uses approximately 10-15 gallons per minute, as indicated by Northern and according to the American Water Works Association, 1000 gallons of water costs $1.50. Material costs: Wood restoration products may be required to revitalize the deck. Mold and mildew can be removed with a solvent. Sealant will be required on wooden decks to protect the wood from future damage. Restoration product is available for $20. Solvent is available for $13. Sealant is available for between $17-$50 per 5-gallons. According to Home Depot, 5 gallons of sealer will cover 300 sq.ft. Highlight your revitalized pressure washed deck by enhancing your outdoor space. Deck Stain: Improve the appearance of a deck with wood stain. Deck stain costs between $2-$4 per sq.ft. with a 2-3 hour labor cost ($120-$300) for a 300 sq.ft. deck. 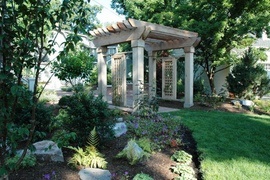 Pergola 1: Add a pergola 1 over your deck for some much needed summer shade. Build or purchase a structure and let nature thread itself through to add a hint of natural beauty. Costs run from between $450-$4500. Some composite decks should not be pressure washed. Mold and mildew should be removed regularly from composite decks to prevent staining. 1 Pergola: An arched structure with an open roof and cross rafters, supported by posts or columns, typically installed in a garden, park, or backyard and usually covered with climbing plants or vines. How much does it cost to pressure wash a deck in my city? Cost to pressure wash a deck varies greatly by region (and even by zip code). To get free estimates from local contractors, please indicate yours.